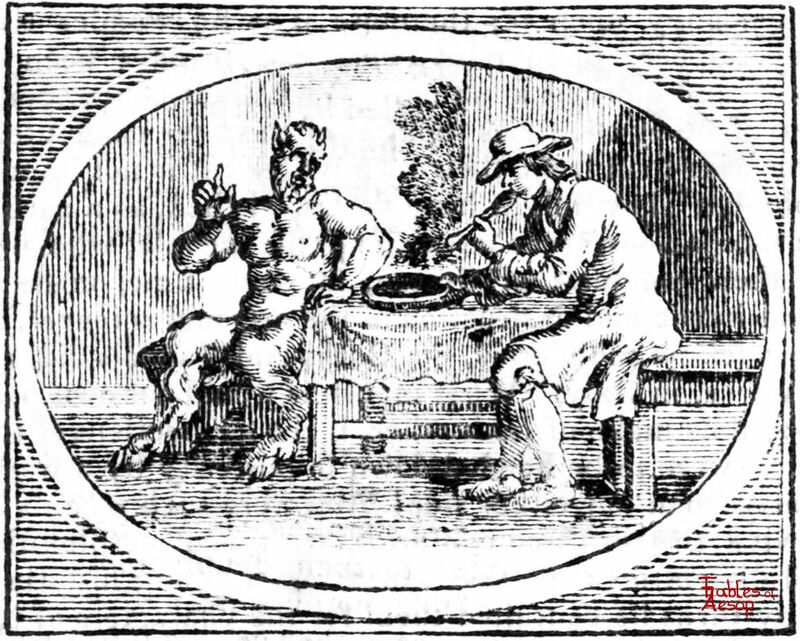 A Satyr is confused by a man blowing to both heat and cool and refused to deal with him thinking he was double dealing. A Man had lost his way in a wood one bitter winter’s night. 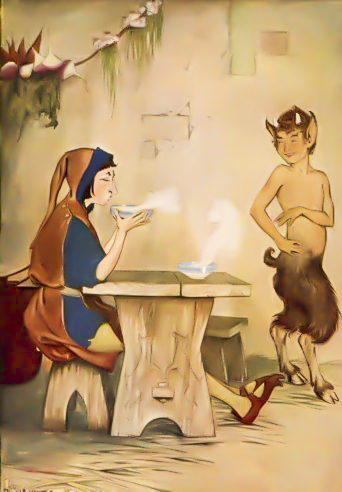 As he was roaming about, a Satyr came up to him, and finding that he had lost his way, promised to give him a lodging for the night, and guide him out of the forest in the morning. 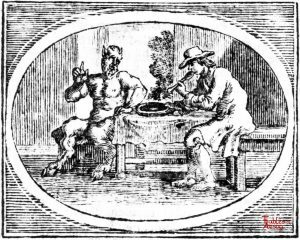 As he went along to the Satyr’s cell, the Man raised both his hands to his mouth and kept on blowing at them. “What do you do that for?” said the Satyr. After this they arrived at the Satyr’s home, and soon the Satyr put a smoking dish of porridge before him. But when the Man raised his spoon to his mouth he began blowing upon it. “And what do you do that for?” said the Satyr. 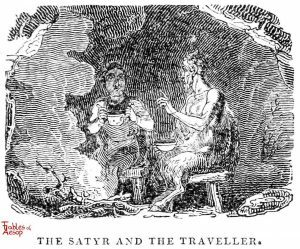 A SATYR, as he was ranging the forest in an exceeding cold snowy season, met with a Traveller half-starved with the extremity of the weather. He took compassion on him, and kindly invited him home to a warm comfortable cave he had in the hollow of a rock. As soon as they had entered and sat down, notwithstanding there was a good fire in the place, the chill Traveller could not forbear blowing his fingers’ ends. 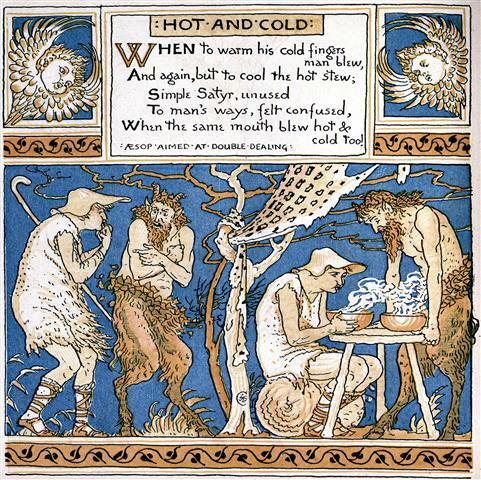 Upon the Satyr’s asking him, why he did so; he answered, that he did it to warm his hands. The honest Sylvan having seen little of the world, admired a man who was master of so valuable a quality as that of blowing heat, and therefore was resolved to entertain him in the best manner he could. He spread the table before him with dried fruits of several sorts; and produced a remnant of cold cordial wine, which, as the rigour of the season made very proper, he mulled with some warm spices, infused over the fire, and presented to his shivering guest. But this the Traveller thought fit to blow likewise; and upon the Satyr’s demanding a reason why he blowed again, he replied, to cool his dish. This second answer provoked the Satyr’s indignation, as much as the first had kindled his surprise: so, taking the Man by the shoulder, he thrust him out of doors, saying, he would have nothing to do with a wretch who had so vile a quality as to blow hot and cold with the same mouth. 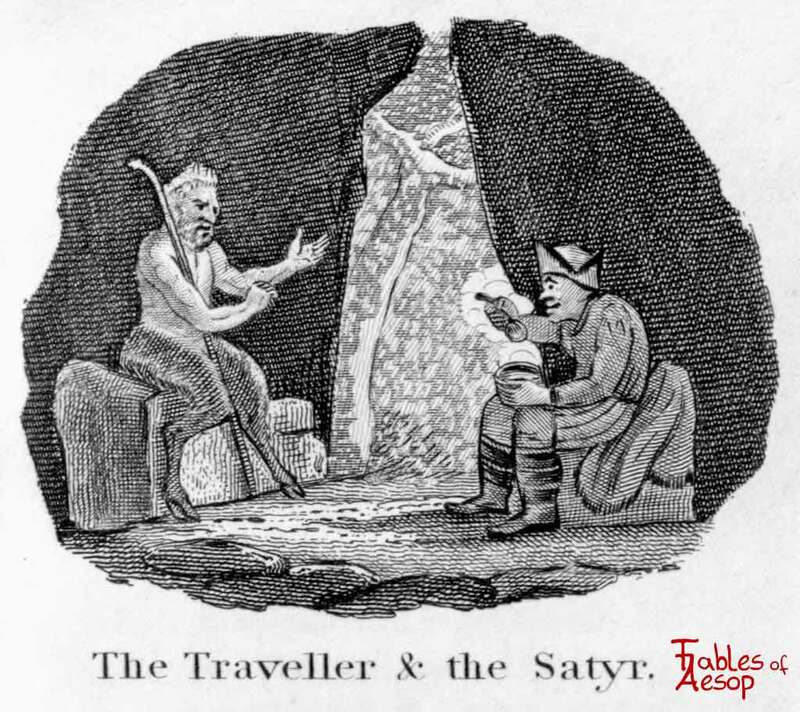 Though the poor Traveller in the Fable was not guilty of any real crime in what he did, yet one cannot help approving the honest simplicity of the Satyr, who could not be reconciled to such double dealing. In, the moral sense of the fable, nothing can be more offensive to one of a sincere heart, than he that blows with a different breath from the same mouth; who flatters a man to his face, and reviles him behind his back. Some again, just like this man, to serve a present view, will blow nothing but what is warm, benevolent and cherishing; and when they have raised the expectations of a dependant to a degree which they think may prove troublesome, can, with putting on a cold air, easily chill and blast all his blooming hopes. But such a temper, whether it proceeds from a designed or natural levity, is detestable, and has been the cause of much trouble and mortification to many a brave deserving man. Unless the tenor of a man’s life be always true and consistent with itself, the less one has to do with him the better. “Oh! what a sharp, inclement day! And what a dismal, dreary way! There’s nought before me but starvation. Who close beside his dwelling stood. Blowing his fingers as he went. Our hero could not wait, but blew it. A man that blows both hot and cold! And slanders soon behind one’s back. And again, but to cool the hot stew. When the same mouth blew hot & cold too! 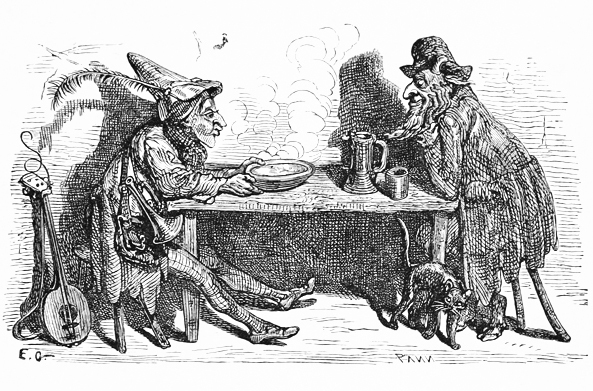 Aesop aimed at double dealing. Fabula innuit devitandum esse eius amicitiam cuius anceps vita est et non simplex sermo, cuius cor et lingua dissimiles partes agunt.